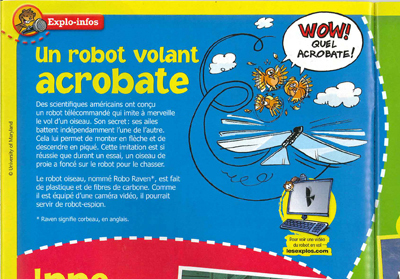 The Quebec children’s science magazine Les Explorateurs is featuring Robo Raven in its November 2013 issue. Les Explorateurs is used in elementary schools as part of science, geography, and history classes. Robo Raven was developed by Professors S.K. Gupta (ME/ISR) and Hugh Bruck (ME) and their students in the Maryland Robotics Center. The latest iteration, Robo Raven III, incorporates solar panels in its wings. While the solar panels don't produce enough energy to power Robo Raven III in flight (they produce around 3.6 Watts while Robo Raven needs around 30 Watts to fly), they are effective in charging the MAV's batteries when it is stationary.